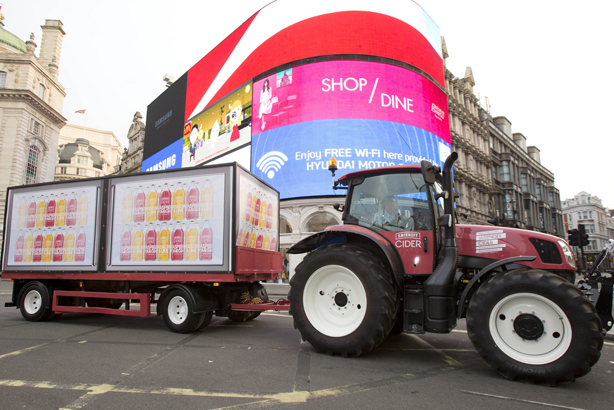 Smirnoff Cider has aimed to kick-start the Bank Holiday by surprising the capital with a large, raspberry tractor doing the rounds at landmarks including Piccadilly Circus and Westminster Bridge. The drinks brand wants the public ‘to get their Bank Holiday on the right track’ with the #SmirnoffTractor, which is touring London today. Members of the public who snap a picture of the vehicle and share it on Twitter, Facebook or Instagram give themselves a chance to win ten cases of Smirnoff cider for them (and their friends). The tractor is parked at Spitalfields from 4.30pm, with free samples being handed out to those over the age of 18. London PR agency Taylor Herring led the creative and production of the tractor.